Capitalism in space: One smallsat satellite company, Exolaunch, has hired another smallsat company, Momentus, to provide it with in-space transportation capabilities. Exolaunch, the German launch services provider formerly known as ECM Space, signed a contract to pay in-space transportation startup Momentus more than $6 million to move satellites in low Earth orbit in 2020 with a service called Vigoride and from low Earth to geosynchronous orbit in 2021 with Vigoride Extended. Essentially, Momentus is building a cubesat-sized rocket engine that can be used to transport other cubesats from one orbit to another. The engine apparently uses water as the fuel in a ion-type engine, and will be tested in space for the first time in the next few months. Momentus’s business plan seems quite clever. Up until now smallsats, especially those launched as secondary payloads, have not had a way to change their orbits, once deployed from their rocket. Momentus is offering this capability, at the very moment we are about to see a boom in the number of smallsats launched. More than two months after they provided relay communications for the landing of InSight on Mars, and more than a month since any contact has been heard from them, engineers now consider the two MarCO cubesats to likely be dead. Their loss of contact more than a month after the November landing of InSight actually shows their incredible success. Both MarCO cubesats functions well past Mars, demonstrating that these tiny satellites can do much of the same things bigger satellites costing billions do. Capitalism in space: Rocket Lab today (Sunday) successfully launched thirteen cubesats using its Electron rocket. With this third launch, Rocket Lab now has more launches than Northrop Grumman (formerly Orbital ATK), a launch operation that has been around since the 1980s. China still leads the U.S. 35 to 33 in the national rankings. Capitalism in space: The smallsat company Surrey Satellite Technology is designing a cubesat communications satellite set for launch in 2021 designed to test technology for providing communications in lunar space. Surrey Satellite Technology Ltd (SSTL) has today announced that it is designing a low cost 35kg lunar communications satellite mission called DoT-4, targeted for a 2021 launch. DoT-4 will provide the communications relay back to Earth using the Goonhilly Deep Space Network, and will link up with a rover on the surface of the Moon. SSTL is currently in discussions with a number of parties for the lunar mission, and expects to disclose further information on mission partners and funding early in 2019. DoT-4 will be the pre-cursor mission for a larger lunar communications satellite to follow in the 2023 timeframe which will carry a more robust payload and which will also have the potential for navigation services. SSTL’s ultimate aim is to launch a full constellation of lunar communications satellites offering full service capability to enable new and regular opportunities for science and exploration and economic development of the space environment beyond Earth’s orbit. It appears that Surrey is trying to grab the market for providing communications services for both NASA’s Gateway project as well as the number of private small lunar rovers that are expected to launch in the coming years. I should add that this project probably only exists because Surrey and its investors know that it will have affordable access to space, using the new smallsat rockets coming from Rocket Lab, Vector, and Virgin Orbital. The two MarCO cubesats that successfully relayed data from InSight to Earth during its landing yesterday continue to function, with one even sending back images. The photo on the right, cropped and reduced slightly to post here, was taken by MarCo-B. Neither of the MarCO CubeSats carry science instruments, but that didn’t stop the team from testing whether future CubeSats could perform useful science at Mars. As MarCO-A flew by, it conducted some impromptu radio science, transmitting signals through the edge of Mars’ atmosphere. Interference from the Martian atmosphere changes the signal when received on Earth, allowing scientists to determine how much atmosphere is present and, to some degree, what it’s made of. As a bonus, some consumer-grade cameras aboard MarCO provided “drive-by” images as the CubeSats sailed past Mars. MarCO-B was programmed to turn so that it could image the planet in a sequence of shots as it approached Mars (before launch, MarCO-A’s cameras were found to be either non-functioning or too blurry to use). This engineering test proves that we don’t need to build billion dollar spacecraft every time we wish to send an unmanned scouting ship to another world. Cubesats will soon do the job quite well, and for a tenth the cost. And there will be a lot of money to be made. Governments and private entities of all types will be eager to buy the services of the garage-built planetary cubesats that private companies are going to soon be building, in large numbers. 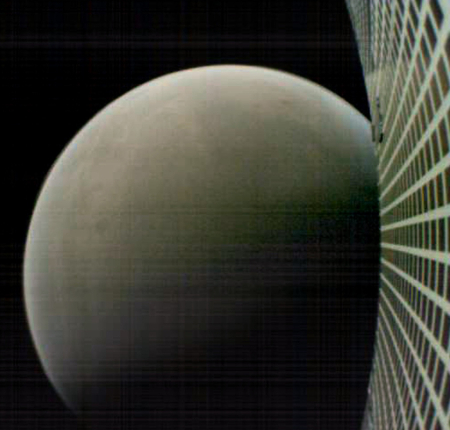 One of the two MarCO cubesats launched with the InSight Mars lander has successfully taken its first picture of Mars, the first such image ever taken by an interplanetary cubesat. The image itself is not that interesting, with Mars not much more than a dot. What makes this significant is that it proves that a small, inexpensive cubesat can be built with the capability to accurately point and take photographs during an interplanetary mission. This means that the entire field of interplanetary probes is prime for major changes, shifting from big expensive and rarely launched spacecraft to small inexpensive cubesats launching frequently and it large numbers. When Japan launches its unmanned freighter to ISS on September 10, it will carry a two-cubesat engineering test of some of the concepts required to build a space elevator. In the experiment, which will be the first of its kind in space, two ultrasmall cubic satellites, or “cubesats,” will be released into space from the station. They will be connected by a steel cable, where a small container — acting like an elevator car — will move along the cable using its own motor. A camera attached to the satellites will record the movements of the container in space, according to the Japanese newspaper The Mainichi. Each cubesat measures just under 4 inches (10 centimeters) on each side. The cubesats will be connected by a 33-foot-long (10 meters) steel cable for the “elevator car” to move along, according to the report. I wonder if this experiment will also test some of the technology needed for generating electricity using a tether. Over the decades there have been a number of experimental attempts in space of this concept, all of which have failed for a variety of reasons, all unrelated to the concept itself. 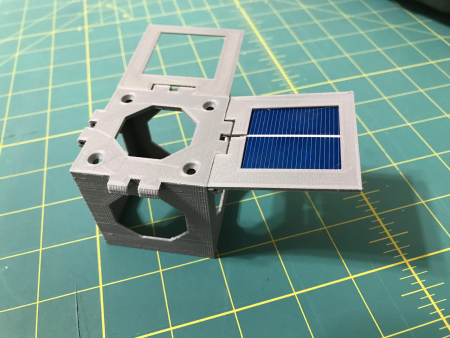 3D-printed solar panels for cubesats! [This is] the first integration of a solar panel with the 3D printed material. The panel is not attached but rather embedded in the plastic during the printing process. This helps protect the panel from transport damage and makes it easier to assemble the final satellite. This design needs a slight adjustment but is almost there. What makes Joe’s work most interesting is where he is doing it. Last week, in posting a link to a story about a Rocket Lab deal that would make secondary payloads possible on its smallsat rocket Electron, I noted that things were moving to a point where someone could build a satellite for launch in his garage. As a matter of fact, I am building a PocketQube satellite for launch in Q3 2019. Yes, I am working in a small shop – just behind the garage. Nothing fancy but the price was right. I am working with Alba Orbital and the flight is scheduled on the Electron. These are very exciting times. Alba Orbital is smallsat company aimed at building lots of mass produced smallsats weighing only about two pounds. This first [satellite] is just to see if it can be done. I plan to have it take a couple images and relay data regarding the orientation methods I am planning to use (gravity and magnetic fields). If it works, I am hoping to get funding to develop a small series of satellites to track global water use. It is also a good way to test some of the materials I think would make spacecraft lighter and cheaper. Yesterday he sent me the above image. This is the future of unmanned satellites and planetary probes, small, light, cheap, and built with 3D printers by single entrepreneurs. And because of their inexpensive nature, the possibilities for profit and growth are truly almost infinite, which in turn will provide developments that make space travel for humans increasingly smaller, lighter, cheaper, and easier to build as well. To repeat Joe’s comment, these are very exciting times. A Chinese cubesat, launched as a secondary payload with China’s lunar communications satellite for its upcoming Chang’e-4 mission, used a Saudi Arabian camera to successfully send back its first images this week. Two of the three images show the Earth rising above the lunar horizon. The third looks down at the Moon’s cratered surface. These images I think are the first interplanetary images ever taken and successfully transmitted to Earth by a interplantary cubesat mission. Both China and Saudi Arabia should be lauded for the success. It proves that cubesats have the potential to do everything that fullsize satellites do, at much lower cost, and therefore marks the beginning of a revolution in unmanned planetary spacecraft design. In related news, that lunar communications satellite has now officially reached its Lagrande point. The satellite, named Queqiao (Magpie Bridge) and launched on May 21, entered the Halo orbit around the second Lagrangian (L2) point of the Earth-Moon system, about 65,000 km from the Moon, at 11:06 a.m. Thursday after a journey of more than 20 days. “The satellite is the world’s first communication satellite operating in that orbit, and will lay the foundation for the Chang’e-4, which is expected to become the world’s first soft-landing, roving probe on the far side of the Moon,” said Zhang Hongtai, president of the China Academy of Space Technology (CAST). The concept of the Halo orbit around the Earth-Moon L2 point was first put forward by international space experts in 1950s. While in orbit, the relay satellite can see both the Earth and the far side of the Moon. The satellite can stay in the Halo orbit for a long time due to its relatively low use of fuel, since the Earth’s and Moon’s gravity balances the orbital motion of the satellite. We’re here to help you! Proposed new FCC regulations on the licensing of smallsats would raise the licensing cost for student-built cubesats so much that universities would likely have to shut down the programs. In a move that threatens U.S. education in science, technology, engineering and math, and could have repercussions throughout the country’s aerospace industry, the FCC is proposing regulations that may license some educational satellite programs as commercial enterprises. That could force schools to pay a US$135,350 annual fee – plus a $30,000 application fee for the first year – to get the federal license required for a U.S. organization to operate satellite communications. If these new and very high licensing fees are correct I find them shocking. As noted in the quote, building a cubesat costs practically nothing, only about $5,000. The new fees thus add gigantic costs to the satellite’s development, and could literally wipe the market out entirely. They certainly will end most university programs that have students build cubesats as a first step towards learning how to build satellites. These new regulations appear to be part of the Trump administration’s effort to streamline and update the regulatory process for commercial space. It also appears that the FCC has fumbled badly here in its part of this process. One of the two MarCO cubesats heading to Mars on the first interplanetary cubesat mission, has taken its a picture of the Earth and the Moon. NASA set a new distance record for CubeSats on May 8 when a pair of CubeSats called Mars Cube One (MarCO) reached 621,371 miles (1 million kilometers) from Earth. One of the CubeSats, called MarCO-B (and affectionately known as “Wall-E” to the MarCO team) used a fisheye camera to snap its first photo on May 9. That photo is part of the process used by the engineering team to confirm the spacecraft’s high-gain antenna has properly unfolded. In a few weeks the two cubesats will make a mid-course correction, also the first time a cubesat has attempted such a thing. Even as the InSight lander heads to Mars, it is being accompanied by two test cubesats, the first such smallsats to ever fly an interplanetary mission. The MARCO mission objective is a challenging one. The team will provide a dedicated relay during Mars InSight’s descent to the surface of the Red Planet on November 26, 2018. Rather than entering orbit, the CubeSats will pass 2,175 miles (3,500 kilometers) from Mars during the larger mission’s crucial landing phase. Mars will be 97.5 million miles (157 million kilometers) away at the time, making for an 8.7-light-minute communications lag from Mars to the Earth. The lag means that NASA engineers will need to wait 8.7 minutes to see whether the landing was successful, equivalent to Curiosity’s “seven minutes of terror;” meanwhile, if all goes well, MARCO will have a front-row seat to the show. While the success of the InSight mission isn’t dependent on MARCO, the CubeSats will provide a black box data recorder of all aspects of the mission’s descent. If these cubesats succeed in accomplishing their engineering test missions, their true innovation will not be engineering but cost reduction. If they prove that cubesats can be designed as interplanetary probes, the costs to build and launch such missions will be drastically reduced. Not only do cubesats routinely use cheaper off-the-shelf components, they are far lighter than standard satellites, which means a smaller, cheaper rocket can launch them. The data-relay test of these cubesats however is quite important, nonetheless. See my post above. We’re here to help you! A suite of 8 private commercial cubesats that the Air Force had agreed to launch as secondary payloads on the August 26 launch of a Minotaur rocket were blocked from launch by FAA bureaucracy. Industry sources believe the FAA never formally rejected a proposed license modification for the cubesats because it did not go through the official process, but it was informally clear that the agency would have rejected such a modification had it been formally submitted. Spire’s problems here demonstrates the difficulties smallsat companies have getting their satellites in orbit, which explains the emergence of a new smallsat rocket industry. The company’s difficulties also illustrates why the launch industry should always be opposed to giving too much regulatory power to government. In this case it really appears that the launch license was denied merely because the bureaucrats involved with approving it at the FAA simply didn’t want to bother dealing with it. Of the 72 cubesats launched by a Russian Soyuz rocket on July 14, 6 have unexpected problems. Four of the 72 miniature satellites sent into orbit July 14 on a Russian Soyuz 2.1a rocket alongside the primary customer, the Kanopus-V-IK Russian Earth-imaging satellite, are not responding to commands from their operators and two additional cubesats are not in their intended orbits. It appears that a variety of causes are behind the problems, not all of which are related to the Soyuz. Posted from Torrey, Utah, just outside Capitol Reef. Capitalism in space: Cubesat builder Clyde Space has commissioned its first satellite communications ground station, with three more planned. Essentially, the company appears to be moving to fill a need expressed by its satellite customers. After building their satellite for them, their customers still need someone to run it for them, and the satellite maker is ideally positioned to win that role. This story also illustrates the continuing simplification of the technology of the satellite industry. Ground stations used to be big complicated facilities, requiring big dishes and lots of land. Now they can simply install an antenna on the roof of a building. Has India cut its cubesat launch prices? Capitalism in space: A complex analysis of India’s recent launch prices suggests that ISRO reduced its cubesat launch prices when it launched a record-setting 103 satellites on the most recent PSLV launch. Small-satellite owners have long complained that the PSLV, whose reliability has been established in the market, has been slow to increase its launch tempo at a time of surging cubesat production. For the moment, none of these satellite customers’ launch options provide predictable launch cadence at affordable prices. That makes it all the more important for ISRO’s Antrix Corp., the agency’s commercial arm, to cement a reputation for launch regularity and low prices. In other words, because a flock of new smallsat launch companies, such as Rocket Lab, Vector, and Virgin Orbit, are about to enter the market ISRO is suddenly feeling the pressure, which is why they have cut prices as well as started to up their launch rate. Capitalism in space: Surrey Satellite Technology, one of the first companies to build smallsats and cubesats, is closing its U.S. factory in Colorado and concentrating its satellite work once again in the UK. Parker said the exact number of people SST-US will let go has not been determined. SSTL’s decision to layoff workers in the U.S. is not related to the decline in geostationary telecommunications satellite orders that triggered a reduction in workers at Space Systems Loral, Parker said. The majority of SSTL’s business is in remote sensing, navigation and science — spacecraft typically found in non-geosynchronous orbits. Instead, Parker said it was more out of concern that the smallsat movement the company had championed for years had picked up steam and was moving without SSTL. “We had grown slightly fatter, slightly more complacent, so we are doing a lot of work on our organization. 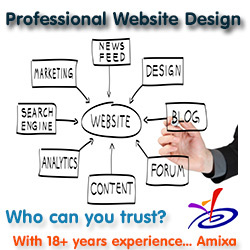 We started last year and changed our organizational structure internally. We changed the way our teams are organized so we now have a much flatter structure with more autonomy,” she said. SSTL is not reducing its headcount in the U.K., Parker said. This kind of reminds me of ULA’s recent effort to streamline its operations, faced with competition from SpaceX. Here, Surrey is finding itself getting beat by a lot of new players, and had found it needs to reshape itself to survive. When the Cygnus capsule was placed in orbit yesterday, it also released a number of nanosats, one of which was a cubesat built by Israeli high school students. More than 80 pupils in grades 9-12 at schools in Herzliya, Ofakim, Yeruham, Ofra, and the Bedouin town of Hura helped to construct Duchifat-2, which weighs just 1.8 kilograms (four pounds), and is just 20 centimeters (eight inches) tall and 10 centimeters wide. Due to its small size, the satellite has no motors and instead uses the earth’s magnetic field to keep itself correctly aligned in space. Cubesats have generally been built and launched as college projects to help teach students the engineering behind satellites. This however was the only nanosat released by the Atlas 5 that involved high school students. Note also that the project did not simply involve Jewish students. The competition heats up: Just like the Chinese tests of a smallsat propulsion system noted in my previous post, this U.S. company is designing a propulsion system for cubesats. McDevitt’s propulsion system is deceptively simple. It combines rocket-fuel-grade hydrogen peroxide with a patented proprietary catalyst to create a chemical reaction that results in thrust channeled through tiny square nozzles incorporated into the small satellite. The system allows the satellites to be steered or stopped. The only byproduct of McDevitt’s tiny rocket motors is water vapor. Except for this quote the article doesn’t provide much information about the design, probably because the builders didn’t reveal the details for proprietary reasons. They hope to launch a test satellite by 2018. The competition heats up: Aerojet Rocketdyne has signed a contract with NASA to develop a small thruster engine for use on cubesats. The MPS-130 green propulsion system will allow CubeSats and SmallSats to increase their capabilities, such as extending mission life, increasing architecture resiliency, maneuvering to higher and lower orbits, and performing complex proximity operations and formation flying. The use of additive manufacturing also reduces the number of parts and amount of time required to fabricate and assemble the modular propulsion system, lowering the cost of small satellites for private and public operators. Under the contract, Aerojet Rocketdyne will deliver a fully-integrated MPS-130 green modular propulsion system for flight demonstration, as well as conduct development and validation testing. The press release does not say how much money NASA is providing. Regardless, this is a great opportunity for Aerojet Rocketdyne, because the smallsat industry is I think about to take off, and at the moment these tiny satellites lack any useful technology for maneuvering. Up until now they were mostly designed as temporary short term satellites built mostly to teach students. Soon, however, there will be a lot of privately-built commercial smallsats launched, designed to make money. Being able to sell their builders a thruster that could prolong their life and make them more capable will give Aerojet Rocketdyne a product that will certainly sell like hotcakes. Link here. The article is a good detailed overview of the many upcoming planetary missions that are using small and relatively inexpensive cubesats as either part of their mission, or are the mission itself. Lifts are so hard to come by that the first interplanetary CubeSat — NASA’s twin INSPIRE mini-spacecraft, intended to test key technology for future missions — has been waiting for almost two years. “We still have to find a ride,” says Anthony Freeman, who manages the Innovation Foundry at NASA’s Jet Propulsion Laboratory in Pasadena, California. The competition really heats up! A research team at the University of California, Santa Barbara (UCSB) has proposed that an array of space-based lasers can be used to accelerate a solar sail to speeds as much as 26% the speed of light, thus making interstellar travel possible. [The] key breakthrough was the development of modular arrays of synchronized high-power lasers, fed by a common “seed laser.” The modularity removes the need for building powerful lasers as a single device, splitting them instead into manageable parts and powering the seed laser with relatively little energy. Lockheed Martin has recently exploited this advance to manufacture powerful new weapons for the US Army. In March last year, the aerospace and defense giant demonstrated a 30 kW laser weapon (and its devastating effect on a truck). By October, the laser’s power had already doubled to 60 kW and offered the option to reach 120 kW by linking two modules using off-the-shelf components. The UCSB researchers refer to their own planned arrays as DE-STAR (Directed Energy System for Targeting of Asteroids and ExploRation), with a trailing number to denote their size. A DE-STAR-1 would be a square array 10 meters (33 ft) per side and about as powerful as Lockheed’s latest; at the other end of the spectrum, a DE-STAR-4 would be a 70 GW array covering a massive area of 100 square kilometers (39 square miles). …Lubin stresses that even a relatively modest orbital array could offer interesting propulsion capabilities to CubeSats and nanosatellites headed beyond Earth orbit, and that useful initial tests would still be conducted on the ground first on one-meter (3-ft) arrays, gradually ramping up toward assembling small arrays in orbit. While even a small laser array could accelerate probes of all sizes, the larger 70-GW system would of course be the most powerful, capable of generating enough thrust to send a CubeSat probe to Mars in eight hours – or a much larger 10,000-kg (22,000-lb) craft to the same destination in a single month, down from a typical six to eight. Further upgrades would make it possible to send a cubesate and its lightsail to Alpha Centuri in about fifteen years. The important point here is that it appears that all the technology for building this already exists, or is relatively straightforward to develop. NASA today announced that the first test flight of its giant SLS rocket, more powerful than the Saturn 5 and intended to make human missions beyond Earth orbit possible, will carry 13 cubesats in addition to its Orion capsule. Because the mission plans on sending the unmanned Orion on an Earth orbit beyond the Moon, these cubesats will have an opportunity to go where no cubesat has gone before. The competition heats up: A California company, Hera Systems, has announced plans to launch 9 cubesats late in 2016 to provide commercial imagery of the Earth. Hera Systems of San Jose, California, is planning to launch nine cubesat-class spacecraft in late 2016 that will be able to provide images at resolutions of up to one meter over several spectral bands, as well as video. That initial constellation could grow in time to up to 48 satellites, allowing the company to take images of the same location several times a day. This field is becoming very crowded. Either there will be a significant shake-out, or we will see a burst of profits that will invigorate it even more. The companies all seem to think there is enough business to justify their existence. The competition heats up: ULA has announced that they are adding a cubesat launch capability to their Atlas 5 rocket so that by 2017 they will be able to place in orbit as many as 24 cubesats per launch, as secondary payloads. In addition, the company will offer universities to compete for six launch slots at no charge. This offer is ULA’s way of trying to capture some of that growing smallsat market that companies like Rocket Labs and Virgin Galactic are trying to grab. The competition heats up: NASA this week awarded contracts ranging from $4.7 to $6.9 million to three different smallsat launch companies. The companies are Firefly Space Systems, Rocket Lab USA, and Virgin Galactic. The second is the company that just won the contract to put a privately-built lunar rover on the moon (part of the Google Lunar X-Prize). In the past, cubesats and other small satellites could only afford to be secondary payloads on much larger rockets. Thus, they were at the mercy of the needs of the primary payload, often resulting in significant unplanned delays before launch. This in turn acted to discourage the development of smallsats. Now, with these private launch companies designed to service them exclusively the smallsat industry should start to boom. Note also the low cost of these contracts. The small size of cubesats and the launchers designed for them means everything about them costs much less. Putting an unmanned probe into space is thus much more affordable. The competition heats up: Spaceflight Industries has purchased a single dedicated Falcon 9 rocket launch to launch 20 small satellites sometime in 2017. This purchase also indicates the growing strength of the smallsat industry. These companies are beginning to gain the investment capital to buy their own launches rather than fly as secondary payloads. NASA has chosen three cubesat missions to fly lunar planetary orbiters to the Moon, to be launched on the first SLS flight in 2018. “NASA has funded three different CubeSats to learn more: Lunar IceCube, Lunar FLASHLIGHT and LunaH-Map. They all look for water in different ways and provide different types of information,” [said principal investigator Craig Hardgrove]. The article is focused on LunaH-Map, not on the other two cubesats, but the fact that NASA plans to use “the most powerful rocket ever built” to launch the first three planetary cubesats, so small they could almost be launched by a model rocket, illustrates some of the problems of the SLS program. Even though that first SLS flight is likely to happen, I suspect that, should it falter for any reason (something that would not surprise me), these cubesats could easily be launched on another rocket, and will be. Putting SLS aside, however, the building of these first planetary cubesats is a very significant development. It once again signals the way unmanned satellite engineering is evolving, finding ways to build spacecraft smaller and less costly. The competition heats up: Spire, a cubesat satellite company focused on data gathering from space, has raised an additional $40 million in investment capital, bringing the total it has raised since 2012 to $80 million. With the new funds, the company will support further growth and expand its constellation from 20 satellites in 2015 to more than 100 by the end of 2017. The latest round of financing comes at a time when the need for advancements in weather and maritime data is at an all-time high. With the potentially catastrophic 2016 Weather Gap right around the corner, Spire offers a solution to the $2.4 trillion dollar global problem. Emerging as a leader in the ‘Space Race 2.0,’ Spire is the only commercial weather data provider with scheduled launches in 2015. The company will begin deploying its satellites on a near monthly basis beginning September 2015. Though the company is willing to gather data in more ways than just weather, its offer to provide weather data suggests that the transition from government to private weather satellites is soon approaching. And there is no reason it shouldn’t. Weather data is very valuable. Just as private cable companies put up satellites to provide communications, so should weather outlets like the Weather Channel. It will pay for itself, and will likely provide us better data than any NOAA satellite. In addition, this story indicates once again that the age of cubesats is now upon us.